When you hear of Machakos county, what rings in your head?……………………………………………………………………………………………………………………….. The answer is as you say, however, can you believe that this county is a beautiful destination of its own calibre? Last, I was on the capital of the county, and was in shock of how this land has challenged Isaac Newton’s law. In this land I have seen gravity defied and water to vehicles go uphill with ease and find it a nightmare to go downhill. This weekend, Sunday 16th of August I made a return to the land again. Machakos county, but to a destination I last visited months ago and I never told the world of what I saw in my last visit. This time, I never went to the capital of the Machakos county but I was headed for Tala and Thui way past Matungulu. This year VOAS international has decided to go to Nigerian this Xmas and New year, And we welcome you to join us on this fun filled Tour for 10nights departing Nairobi on 23rd Dec to return on 2nd jan 2016. This a group tour and we welcome anyone 22yrs and above , who wants to have fun, shop and tour the world and experience their new year in a different culture….. Most of us know and kind of connect with Nigerian through Afro cinema avenues thanks to Nollywood, Given that unlike other cinemas allover the world Nigeria film industry doesn’t film in studios they shoot on various locations….Besides having fun and shopping ,During our tour we will visit the following attractions and get involved in various activities..
Kalakuta Museum used to be the home of Fela Kuti. It was once his revolutionary headquarters that has become a museum. Walk inside this house and imagine everything that the legendary musician did while on earth, the place is breathtaking. Ikeja Shopping Mall: If you love the aesthetics of gigantic malls and galleries, you’ve just discovered the perfect spot for you. The shopping centre houses the 5-screen Silverbird Cinemas, the first and only cinema theatre in Ikeja, and Shoprite Supermarket. It also include specialist facilities for department stores, banks, cafés, bars, restaurants, beauty shops/salons, with some of the big brands such as Mr. Price, KFC, Nike, Adidas, Apple, PC Corner, Rhapsody, Barcelós, Mango store, Samsung, Sony, LG amongst others, setting up shop there. It is a place for friends and family to go shopping and hang out, it will be an experience like no other. 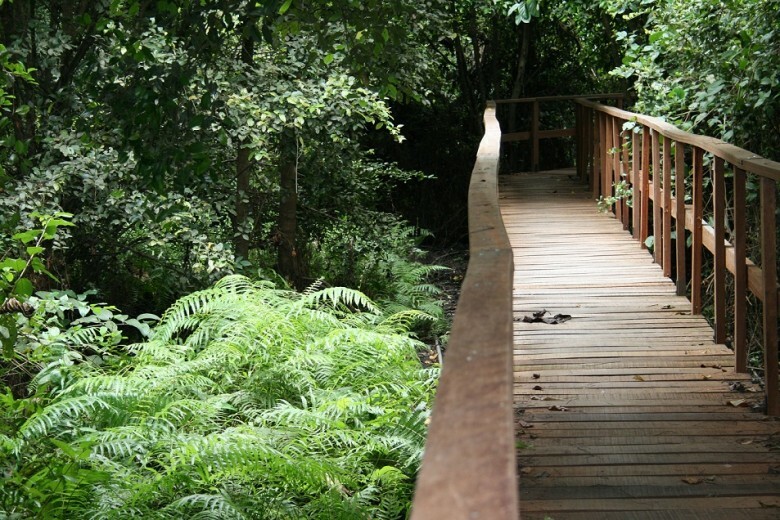 Lekki Conservation Center: You want to get closer to the biodiversity of Nigeria and the wild life? Located on Lekki Peninsula across the street from the Chevron complex is the Lekki Conservation Center. The Peninsula consists of swamp and savannah habitats. The reserve has a 1.8km nature trail so visitors can view the reserve as they stroll through a boulevard of coconut trees. There is a 21 metre-high tree platform known as the tree house where you can have a panoramic view of the reserve, a visitor’s centre, a picnic area and children’s playground among the trees, and a bird hide overlooking a swamp/marsh which is home to crocodiles and monitor lizards. In the trees are Mona monkeys and other species of monkeys, the open grasslands are home to bushbucks, Maxwell’s duikers, giant rats, hogs, mongooses and a remarkable variety of birdlife. Park rangers are available to guide you through the reserve. The reserve is a beauty of nature in a world class environment. Coconut Beach: It’s a sunny vacation day, and you want to get lost from the fast lane of the urban life? Coconut beach is the perfect getaway. It is a beautiful beach in the coastal town of Badagry, west of Lagos. The beach is attractively set in an area surrounded by coconut trees. About 20 miles towards the border of Nigeria and the Republic of Benin, Coconut Beach is accessible through the Lagos-Badagry expressway. The beach, which has the historical reputation of being a centre for slave trade in the 1800s, is pleasant and fascinating, and it provides excellent holiday relaxation. Visitors who are unaccustomed to the tropical sun are advised to wear hats as it can be rather warm at mid-day. The Jazzhole: If you are a lover of good music, books, and African artwork, the Jazzhole is a haven for you. 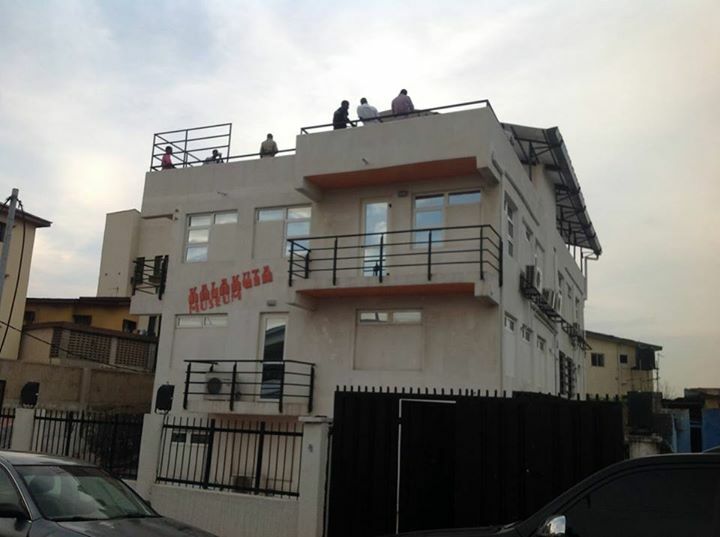 Jazzhole Records is an independent label based at 168 Awolowo Road, Ikoyi, Lagos. Created in the 90’s together with the Glendora Book library, it is credited as one of the best music shops and cultural centres within the country. It is an African lounge with endless Jazz and Soul, and also a place where you can read from the largest collection of good books. 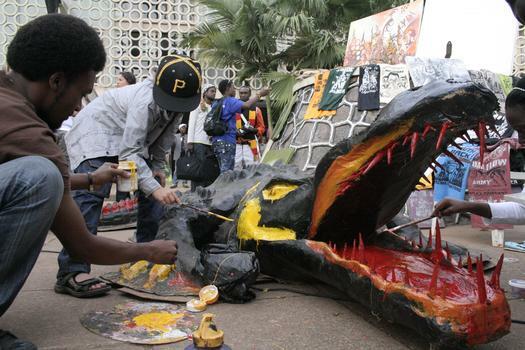 They also do monthly art exhibitions showcasing the African strength in literature, music, arts, and more. At the back is a snack bar, were they have loads of different types of tea, fresh coffee, cakes and delicious sandwiches. In the evenings there is a live jazz band while the audience is scattered all over giving rise to a very cool environment. Trust me, it’s a place that’s worth every minute of your time. National Theatre: If you are a fan of arts and culture, the National Theatre presents you with such luxury. The National Theatre is an architectural masterpiece and a cultural landmark located at Iganmu, in the heart of Lagos. It is easily accessible from every corner of the city. Covering an area of about 23,000 square meters and standing well over 31 meters tall, the multi-purpose National Theatre was established for the preservation, presentation and promotion of Arts and Culture in Nigeria. The design for the existing National Theatre in Lagos was taken from the Palace of Culture and Sports in Varna, Bulgaria. It has galleries of modern Nigerian art, Nigerian crafts and other African arts. The best time to visit is between 10:00am and 3:00pm Tuesday to Saturday, when all three galleries are open. It is an arena of international music concerts, dramas, film shows, symposia, exhibitions, conventions, workshops and even sports. This is the best place to see natural savannah habitats and swamp that have wildlife activities. The boulevard of coconut trees is a romantic place to stroll and there are lots of places for picnic, kids playground and open grasslands for animals like bushbucks, mongooses, hogs and lots more. 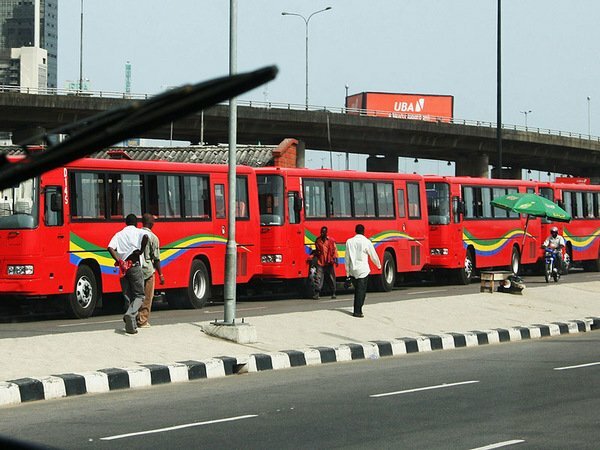 PORT HARCOURT CITY is also referred as garden city and attracts lots of luxury travellers, they say it the place to be if you attract finer things in life, during the three nights stay here we will have a spa treatment , mix and mingle with the local community through various activities e.g visiting a local cultural theatre, indulging in their cuisne and club scene, we will climax it all by attending a new years eve beach party……. The Kwita Izina is a traditional naming ceremony where the community members suggest names for a new born infant; this practice has been adopted for naming gorillas . The park rangers, researchers and those charged with the safekeeping of these unique animals suggest names for all young gorillas born in the past year, generally based on observed behavior and characteristics. For more than three decades the ceremony has been performed for Rwanda’s newly born mountain gorillas; it became a public ceremony in 2005 and was officially named Kwita Izina in 2007. The event is seen as a celebration of Rwanda’s conservation efforts in protecting the endangered mountain gorilla. The naming is accompanied by traditional music and dance and the event helps to raise funds for conservation. The Marsabit- Lake Turkana Festival is a conglomerate of 14 communities that forms the bulk of the larger Marsabit County’s populace. The festival was proposed by the local communities who reside on the Eastern shores of Lake Turkana in Marsabit County. It was initiated in the year 2008 and has since been an annual event. The event Features unique performances and cultural traditions of 14 ethnic communities which live in Marsabit County: El Molo, Rendille, Samburu, Turkana, Dassanatch, Gabra, Borana, Konso, Sakuye, Garee, Waata, Burji and Somali. The presentation of the customs and living conditions of the fourteen tribes, their spectacular traditional costumes, arts and crafts, dances and music is a unique and fascinating experience – in particular in light of the stunning geographical characteristics and the limited general knowledge about the Lake Turkana and Marsabit County. At first glance, this sounds like a light culture entertainment programme but the three days event will serve a deeper purpose in the region. The Marsabit-Lake Turkana Cultural Festival gives all the communities in Marsabit County an opportunity for the cross-cultural interaction, harmony, cohesion, integration, cooperation and trading. The underlying main goal, therefore, has been and continues to be, promotion of peace and reconciliation. Together with Ian Craigie, the Competitions Secretary, Cecil encouraged the Competitions Committee to organise a long distance rally. Their moment came with the death of King George VI and the coronation of the new Queen, Elizabeth II in June 1953. A proposal to organise a rally through East Africa to pay tribute to the new Queen was accepted by the Management Committee and the ‘Coronation Rally’, starting from Nairobi around Lake Victoria through Uganda and Tanganyika and returning back into Kenya was established. When independence was gained by the three African countries – Kenya, Uganda and Tanzania – in the early 1960s, the historic rally route was changed. It would still pass through Uganda, Tanzania and Kenya, however organisers were to rotate the start and finish of the rally, to include Kampala and Dar es Salaam. 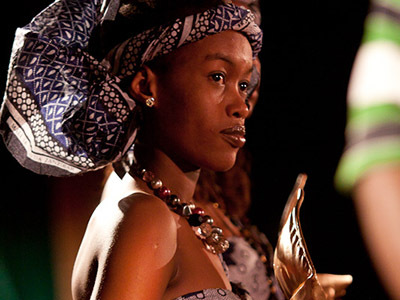 This festival is a blend of Film, music and culture Film- Each year, some of the most captivating and cutting-edge cinema from Africa and beyond is screened in venues across the island. From world-premiers to local shorts, Films are submitted based on a yearly theme and entered into various categories and competitions. The final night is an awards night, where the winning films are recognised and celebrated. 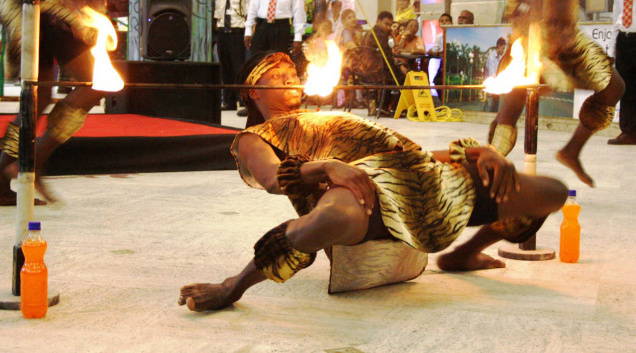 Bayimba International Festival of Music and Arts is held every year in kampala, Uganda’s capital and is organized by the Bayimba Cultural Foundation since 2007. This exciting three-day festival takes place annually during the month of September and provides a platform for known and upcoming artists from Uganda, the African continent and beyond to showcase their artistic talent to an ever increasing and varied public. The Lamu Cultural Festival is the biggest event in Lamu and has previously attracted over 30,000 visitors. The Festival has served to instill pride in the youth of Lamu to value their living culture and encourage the people of Lamu to realize the intrinsic value of their heritage and safeguard it for future generations. The Festival highlights Lamu’s heritage in a carnival atmosphere featuring musical performances and dances, henna competitions, dhow and donkey races and traditional craft displays. Every year there is a theme, The Festival creates a spirit of unity, bringing together the local communities in a celebration of their culture and identity, as well as visitors from along the Kenyan coast. The streets of Lamu are nowhere more than eight feet wide. The proximity of the high stone walls cools the air and means that the streets are always in shadow. An unforeseen benefit of their narrowness means that there are no motor vehicles in Lamu; all transport is by handcarts and donkeys. There are over 160 historic houses clustered in Stone Town, all built to the same traditional design, with a central courtyard surrounded by long narrow galleries and a flat open roof, sometimes shaded by a palm- frond thatch shelter. Most of the houses have ornate carved wooden doors and, inside, walls of elaborate carved-plaster niches that have to be seen to be believed. depicts both the Arabian and African cultures in a unique way. The festival features multicultural floats, music, dance performances and colourful parades with people in amazing costumes. Tourists who visit Mombasa during the festival have the opportunity to shop for souvenirs and enjoy delicious Kenyan dishes in the food stalls set up on the streets of Mombasa. he first venue of the festival was the shade of a mango tree. Today the festival is staged at the new TaSUBa Theatre, a 2000-seat amphitheatre with modern sound and lighting facilities – the largest venue for performing arts in all of East Africa. INTERNATIONAL CARMEL DERBY- MARALAL KENYA. The Maralal International Camel Derby is both a serious sport and a wonderful spectacle: with entrants from Australia, America, New Zealand, Canada, England, France, Spain, Japan, South Africa and around the world, it is a fusion of colors, cultures and marvelous animals: all competing in the desert for the honors of having the top camel in the world. 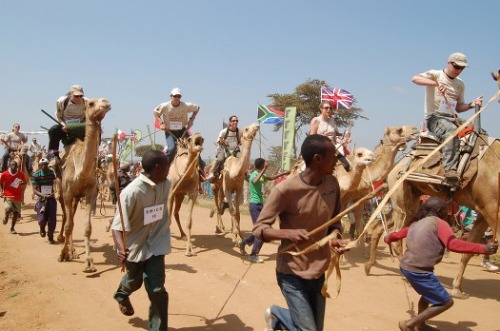 Hosted at the Yare Camel Club and Camp, 3 kilometers south of the township of Maralal, the The The Maralal International Camel Derby tests the speed and strength of the camels, and the handling abilities of their owners or jockeys. In addition, cycling races, donkey rides, local dancing displays and stalls where curios and handicrafts, among other things, are available. The theme of The The Maralal International Camel Derby is “Hit ‘em up, move ‘em out, raw hide” promising much exciting camel racing in the desert. The competition, raging since 1990, pits the best international jockeys and their one-humped friends against the reigning Kenyan champions. The competition provides a useful way to promote awareness of increasing desertification: the rapid spread of deserts inland, eroding arable lands, occurring as a result of increasing industrial pollution and climate change. Two events take place over a number of days, making The Maralal International Camel Derby, a great festive few days of superb spectacle. Join in the fun by hiring a camel and a handler for the day, and enter the amateur races over 10 kilometers for a fun ride through the desert. The elite race is 42 kilometers, passing through the Maralal township and semi-desert environments. Enter the The Maralal International Camel Derby to discover just how versatile these creatures of the desert are. Finely tuned to withstand the most arid of conditions, camels will amaze you at how far they can go; their bodies have adapted to desert conditions, making them the ultimate vessels that glide effortlessly through the desert.